Ingrid Siliakus - New York Times - Real Estate - Key Magazine, October, 2010. New York Times - Real Estate - Key Magazine, October, 2010. For the cover of the autumn issue of the New York Times Key Magazine (a real estate magazine) Ingrid designed a special artwork. 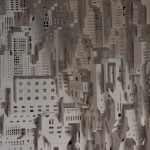 The subject of the artwork is buildings. 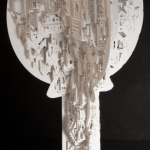 The upper part of the key is based on the skyline of New York. The bottom part of the round shape involves buildings based on the skyline of Amsterdam – mainly seen from the Central Station part of town. This part is mirrored. On the small bottom part of the key building bits of previous projects are added. 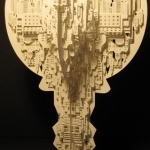 The Key artwork has four identical sides, each cut/folded out of a single sheet of paper. The first and fourth side are connected to each other by means of slits and tabs. This way the artwork can be loosened. When this is done, it is possible to fold the piece into a two-dimensional surface. Another side of the artwork. 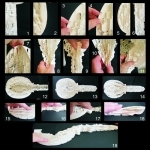 Presentation of folding the work to a two-dimensional surface.